Old country-house, 4 rooms, 2 bathrooms, sleeps up to 9 people. 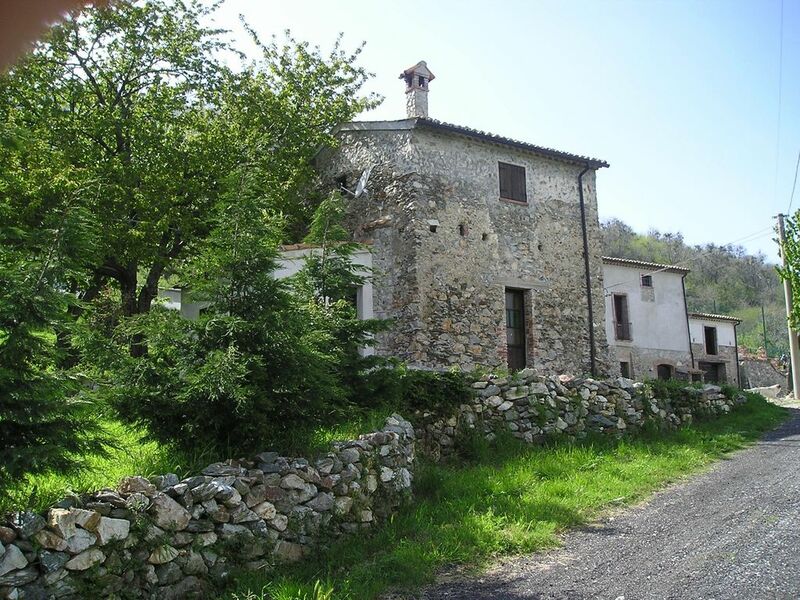 In the midst of the Tirrenian Appennine, in Calabria, part of a large property of about 50 acres of olive trees and chestnut woods, lies the Borgo Berarda. Within the completely refurbished Borgo is a large country-house with 3 bedrooms, living-room with kitchen, 2 bathrooms, large courtyard facing a chestnut wood. The tennis court is located at the side of the yard. The house enjoys a wonderful vista on the Sila valley. The house sleeps 1 to 9 people. The guests enjoy full acces to the property and its attractions, which include a restaurant, trekking paths, and the full privacy of a secluded property wthin nature. The nearest beach is half an hour drive, so that one can choose to enjoy a day at the sea, or the cool breeze of the low mountain trees. Quads vehicles available to rent. We produce and sell our own cold-pressed, organic, Olive oil, and the reastaurant serves a variety of fine dishes and organic vegetables from our many gardens. Private Yoga lessons on request. We decided to rent the cottages so we could take better care of the property and at the same time enjoy meeting people from abroad. The cost stated is for 1 to 4 people. For groups of more than 4, or for long stays, please contact the owner. We try not to add excessive EMF pollution to the one already in the environment. I will turn on the Wireless on request for a couple hours a day so you can check emails etc. It was better than we hoped it would be. Everything was just perfect. The area, the house and wonderful host. Very friendly place. Thank you. Thsnks Peter and Nadia. Was a real pleasure having you here! A great few days in the Italian countryside! Accommodations were adequate and we had everything we needed. Pierpaulo was very helpful and responsive. We loved being off the beaten track among the olive trees, the sheep and the goats! Montalto Uffugo is just a few kilometers away for groceries and restaurants, but the house is peaceful with lovely views. Thanks Sally. Say hi for me to the rest of the gang! We have nothing but praise for our stay at the casale. We were greeted by the owner's son Pierpaolo who kindly travelled to meet us so that we did not get lost. The house (or more accurately houses) was excellent for our needs. It slept 8 but as we were only two we had masses of room. The house was very clean and well maintained. It was well away from other people yet was within easy reach of local villages. We used it as a base for walking up the hills for several days. At other times we walked across the valley to villages beyond. Considering it was Italy we saw very few tourists on our side of the valley. On other days we used the car to travel to the Sila National Park and walked around some of the lakes where there were more tourists. The location of the house was excellent for very different types of activity. It was only about 25 minutes to the beach at Paola. As we were on vacation in early October the weather was not overbearing and suited us. The land around the house is very private and you could spend your days there without being disturbed if you wished to do this. On leaving the front door you are immediately among olive groves! The facilities of a tennis court / mini football is excellent for families or larger groups. Just below the casale is a small restaurant which was very handy when we did not feel like eating in. The photos do not do the houses justice and we were amazed at the space we had. We were even given a choice of which accommodation we wanted when we arrived (the big house, the studio attached to it or a separate house just below) we chose the big house! Facilities were up to date eg two bathrooms, utility room as well as three dedicated bedrooms. They had evidently been refurbished recently to a good standard. There is a permanent canopy and outside table for breakfast which we used every morning and would be good for evening meals earlier in the season I suspect. As the owner live a few hundred metres from the house they were always on hand to help out if needed. Pierpaolo (the son) regularly enquired how things were going and was very helpful in recommending areas to see or restaurants etc. WiFi was available for my iPhone near the owners house and it was useful to check emails every few days. I would have no hesitation in recommending the property to families, couples or someone wanting a quiet time away. If we return to Calabria we will definitely come back to stay. Thanks a lot! It's been a great pleasure to have you both here and hope to see you again! Location très agréable. Le mobilier est solide, les lits confortables, la propreté impeccable. De plus les propriétaires sont charmants et serviables. C'est une bonne adresse à recommander. Merci aux propriétaires de faciliter le séjour. Merci beaucoup Michelle et Claude!! Nous avons passé un court séjour dans cette location très agréable, calme, propre et où rien ne manque. Pierpaolo et sa "mama" nous ont accueillis avec beaucoup de gentillesse et de générosité. Toujours très disponibles, soucieux que nous ne manquions de rien. Nous les remercions chaleureusement et recommandons fortement cette location. Cher Michelle e Claude, merci de tout. Etè un plaisir votre residence ici. Thanks for a very nice stay in your house! We enjoyed the house and the spacious surroundings, ideal for our two girls age 4 and 6. We chose the house because of its charm and its privacy, far from other tourists. We were not dissapointed and were happy to explore the friendly, rural atmosphere and the beautiful countryside. We found little, charming beaches in San Lucido, ideal for our little girls. During our stay our daughter had to see a doctor and we were helped a lot by Pierpaolo and hvis mother. We did not expect that and thought of it as a very friendly and caring gesture. Over all Pierpaolo was a farefuld host concerned that everything worked well in the house and that we felt at home. Our warmest recommendations go to this house! Thank you so much Soren and Rosa. I'm glad you enjoyed your stay as we enjoyed your lively presence. Large cottage within a property of about 50 acres. Montaneous landscape with chestnut woods and olive trees. Closest beach at 25km. Sila mountain 1 hour drive. Many medieval villages nearby. City of Cosenza at 30km. Tennis court and restaurant within the property. Family owned and gay-friendly. Beware of the 5yards of dirt road to get to the house (that is, drive slowly). Other Activities: Trekking, possibility of renting Quads to roam on the hills. Because of current re-landscaping, the tennis court is run-down but usable.